Elise Maree: postage paid, letter recieved. 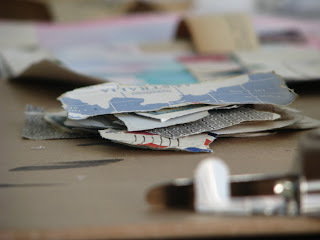 I adore this picture of a pile of stamps in my studio. There is art in everything! so my work shop with cheri went really well! i came home with a cricket whos legs are made out of scrabble letter holders. I am yet to decide whether or not to dress him up in some purple leather me and a friend went and cut off a chair that was on the side of the road for council cleanup or just to leave him as he is. also this saturday at manly public school me and my friend rachel will be selling out art and some funky knick knacks and trinket treasures if you'd like to join us.